We at Second To None Meats are committed to providing the best product and customer service available. Welsh Black Beef has proven to be an excellent product and has become a “Natural” choice that our customers ask for on a regular basis. Our customers want a healthier choice of Beef Cuts compared to commercially produced Beef. They also want grass fed beef and beef which is “Melt in your mouth tender”. Black Welsh beef delivers this. We invite you to join the “Slow Food Movement” and take the time to prepare a Remarkable piece of Welsh – Black Beef. You won’t be disappointed. Easy Keepers - used to grazing or browsing in rocky terrains in Wales (Eat less and pastures last longer). Good body hair during winter months - very hardy with thick hide and coat which preserves energy. Good pelvic size on cows and heifers - easy calving and minimum birth assistance - many surprise births (heifers) with no difficulties. Birth weights consistently in 80 - 85 pound range and often less. Good milk production with high butterfat. Medium sized body (carcass) and shorter legs - easy handling. Very good growth and finished carcass results with proper feeding practices. Excellent marbling and carcass quality. Good docility - easy to work with. Excellent cross breeding results with other breeds. No problems with udders or foot rot or pink eye. 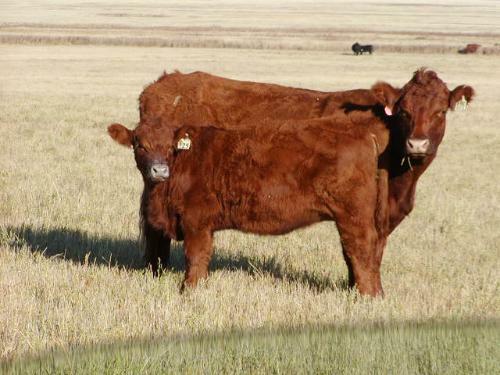 High fertility with no open cows in fall - heifers breed by one year old or sooner. Excellent longevity (15 to 18 years) with calf production. Low maintenance with proper cattle handling facilities and techniques. Polled and Red coloured animals breed true to colour. P.S. Our previous herd sire (Red Welsh) had hair on his forehead that made him look like he had a “Beatles” haircut. Consequently, because Wales is close to Liverpool in Britain we called him “Ringo” and the name really suited him. We have a yearling bull calf that looks just like him and we will be calling him “Ringo 2”. I was not satisfied with the fertility and high calf losses at birth with the cattle I had, so after some research I took a chance on a package of Welsh Black heifers and a bull sight unseen from Alberta. Since then all my cows have caught to the bull, all the Welsh Black calves have been born unassisted, no more prolapses, and the vet hasn't been called. As a bonus the Welsh Blacks are very docile and easy to handle alone and stay in the paddocks with minimum fencing. Cariboo Cattle Co., Williams Lake, B.C. We chose Welsh Black to cross with our predominately Hereford cow herd hoping to improve hardiness, milk production and overall performance. The aggressive breeding of our first Welsh Black bulls showed immediate results, with the crossbred calves weaning heavier than expected. We now plan to change the entire eleven hundred cow herd to the black-baldy cross cows.